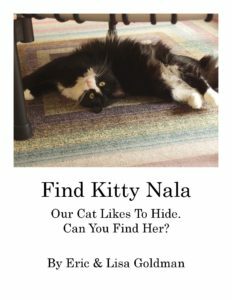 A year ago, I did an interview about the Find Kitty Nala book for the website “All About Cats.” I intended to repost it here but the draft got buried. Today, I’m celebrating Caturday by exhuming this draft (better late than never, I guess). The Find Kitty Nala PDF is now available as a pay-whatever-you-want price, including free, so I hope you’ll check it out. (A hard copy version is also available). Q: How did Kitty Nala join your family? In 2013, our kids started pleading to have a pet join our family. Initially, we fostered a few dogs, but none of them were a good match for our family. So we instead considered adopting a cat. We met Kitty Nala through an adoption program, and she immediately won us over with her spunkiness and her sweetness. We brought her into our family and she now dominates every aspect of our household. Q: Why did you publish your book, Find Kitty Nala? We quickly learned that Kitty Nala, like many other kitties, likes to hide. Perhaps unlike other kitties, Kitty Nala did not just have a few favorite hiding spots. Instead, Kitty Nala seemed to constantly try new and different spots to camp out. We were impressed by her cleverness and cuteness, so my wife started taking photos of Kitty Nala in her different hiding spots and posting them to Facebook with the challenge to her friends to “find the kitty.” Over time, my wife’s “Find Kitty Nala” posts became quite popular, and our friends clamored for more photos. After nearly 3 years of postings, we had enough photos to create a book; and it seemed like people beyond our Facebook friends might enjoy getting to know Kitty Nala. So we assembled the “Find Kitty Nala” photos from Facebook, and we are now really excited to share the collection with the world! Q: In the book, a dog named Laddie makes some appearances. What’s the backstory, and how do they get along? As I mentioned, we had decided not to add a dog to our family. Plus, having one kitty is a big enough challenge for us! However, my mom died in Spring 2015, and she had a Shetland Shepherd (a “Sheltie” who looks like Lassie but is smaller) named Laddie who became an orphan. Even though we weren’t in a great position to take Laddie in, we welcomed him into our home. Laddie loves to play games and would love to have a playmate. He occasionally tries to engage Kitty Nala in dog-style play, i.e., he gets into his “Sheltie crouch” and bares his fangs, ready to chase or be chased. Kitty Nala, however, was unimpressed by the interloper encroaching her kingdom, and mostly responded to Laddie with malicious indifference as cats uniquely can do. But occasionally Kitty Nala is so amped up that she does try some kitty-style play on him, i.e., sneak attacks on him when he’s not looking. So sadly neither has figured out how to bridge the cat-dog divide, and thus they basically ignore each other. Some people who aren’t cat lovers have been puzzled why we would publish a book about our cat, but I’m sure your readers fully understand our decision intuitively. Otherwise, once people start engaging with the book, it becomes fairly addictive to check out just one more photo. Like potato chips, you can’t consume just one. I’ve seen reader groups “race” each other to try to find Kitty Nala the fastest, so reading the book as a group becomes a fun social game that appeals to the entire family, from grandparents and grandkids. Some of the photos are quite difficult, but finding Kitty Nala becomes easier when readers “think like a cat” about the location of the best hiding places. All photos come with an answer key, but readers have more fun when they give it their best effort before checking the answer. Q: What have been your biggest challenges with Kitty Nala? Kitty Nala does not accept the concept of doors. If a door is closed, she thinks it’s fun to use her kitty superpowers to open it one way or another. For example, if we go outside and merely close the screen door (rather than the glass door) behind us, Kitty Nala can easily open the screen door and escape. It’s not because Kitty Nala has somewhere to go; she simply wants to prove that doors can’t stop her. So if she escapes, Kitty Nala doesn’t go far–we find her lounging in the grass a few feet away from the door, purring in a self-satisfied way, basking in the glory of her liberty. ← Celebrating Our 20 Year Wedding Anniversary!